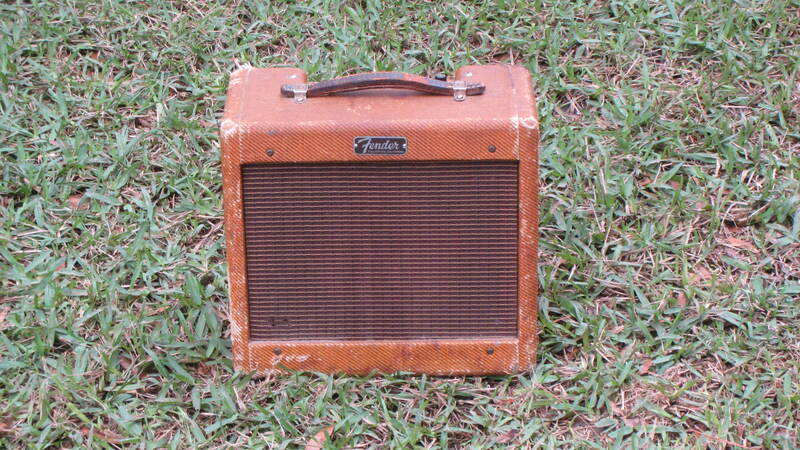 Another great vintage tweed Fender Champ. This is a 5F1 model Champ and the serial number is C 16648. This serial number tells us this amp was probably made some time near the end of 1961. The tube chart code is a little hard to make out, the first letter looks like a K (which it would have to be for a 1961 amp) but the second one is anybody’s guess. We don’t have a photo of the speaker code which can also be helpful in approximately dating a vintage Fender amp. It looks like the tweed has developed an orange-ish patina. You can clearly see the difference in the photo of all the caps (which look original). The area behind both of the removable rear panels is clearly lighter from being unexposed all these years.